Anyone who has spent any time around the SimHQ and CH Hanger forums well knows the affable and most helpful Ken “531 Ghost” King. A hands on, ‘can do’, type of former Marine (aren’t we all? ), Ken molds the materials he has at hand into unique and highly functional forms. Note his ever-evolving gaming cockpit, commenced with an old daisy wheel printer stand, as a prime example. Although a left coaster by current location, he has a lot of home grown Yankee frugality and ingenuity about him. So it was natural given Ken’s close ties with the fine folks at CH Products that he push the envelope of their Pro Throttle. Now, as Ken is quick to point out, no modification is required of the works first time, every time, CH Products gear, but in his words “I had the time and curiosity, so why not?” And so the “Franken Potato” was born. First, some insight into the naming convention of his brainchild, Franken Potato (FP). “Potato” was the original CH Products marketing code name for the Pro Throttle, and of course “Franken” is an abbreviation for the somewhat similarly talented Dr. Frankenstein. In essence, breathing new life into an already solid form. 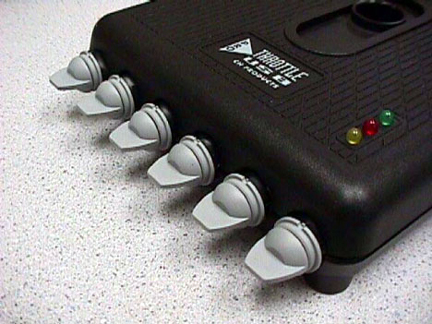 Or, if you prefer, one heck of a monster device. Secondly, Ken was a primary beta tester, and some would say evangelist, for CH’s inspired follow on Throttle Quadrant (TQ). Combining the best of both into one device was Ken’s goal, and by the end of this user’s review I feel confident you will agree that he well accomplished the mission. There are actually two variants of the FP, the full blown device that utilizes many of the TQ’s capabilities by way of base switches and rotaries, and the “semi-FP” as I call mine which adds just the rotaries. Lack of rotaries has long been one of my few complaints and wish list items for the Pro Throttle, so gaining same by way of the semi-FP was a big plus for me. The FP and semi-FP essentially add the Printed Circuit Board (PCB) from the TQ into the form fit of the FP and then additional rotary and toggle switches are installed and connected to this card. 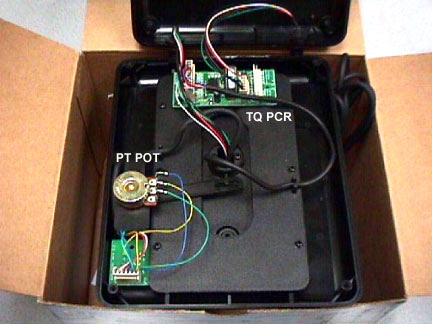 A discrete USB interface is connected to the TQ PCB, but thanks to the miracle of CH Products (Bob Church’s) CM4.0 (controller management software, both devices are readily seen and may be easily programmed. So then, without further ado, let’s get down to the far more interesting pictures worth 1024 words. Throttle Quadrant PCB mounting to the base of the Pro Throttle. 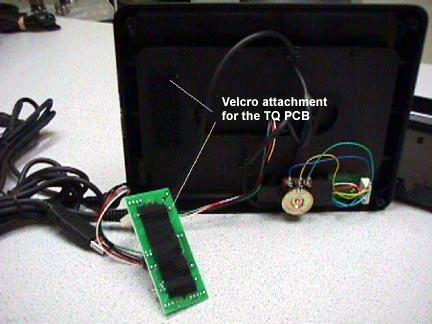 Ken utilized Velcro as an easy and efficient means to mount the TQ PCB to the base of the Pro Throttle. The base real estate shown was vacant, flat, and is well out of the way of the throttle’s moving parts. 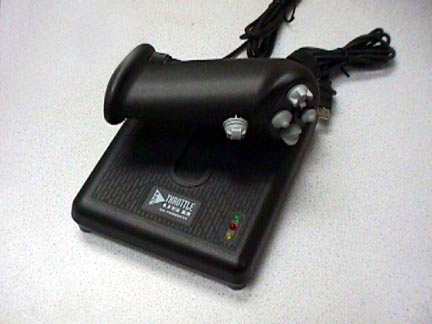 The Pro Throttle grip modified to accept rotary switches. 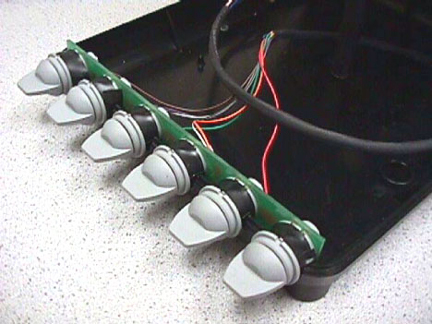 Ken meticulously reams holes for two rotary switches and a relocated communication hatswitch. The primary rotary occupies the former commswitch location, with that switch moved, unobtrusively, to the backside of the throttle grip. Although now non realistically located, in practice the commswitch is more intuitive, as it directly maps the vertical positions to the CH Print sheet. Up is truly up and down is truly down. I find that I’m able to elicit the comm. functions with the base of my thumb and therefore just as quick to operate as in its stock position. The index rotary is suitably wide and very Cougar-like in location and function. The pinky rotary is slightly wider and the finger falls naturally in place. All in all, a very ergonomic modification. 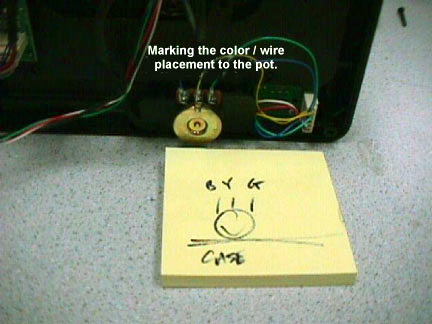 Note in the above figures the additional USB cable for the TQ PCB. Also the natural pinky finger location of the secondary rotary and thumb elicited Commswitch relocation. Ken well employs the Old Corps K.I.S.S principle. Nothing fancy, but it gets the job done, and done right. 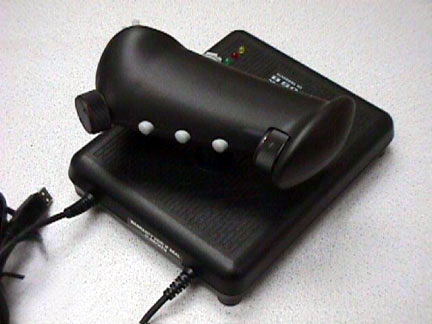 As for the Franken-Potato III modification, this includes six two-way “flipper” switches. 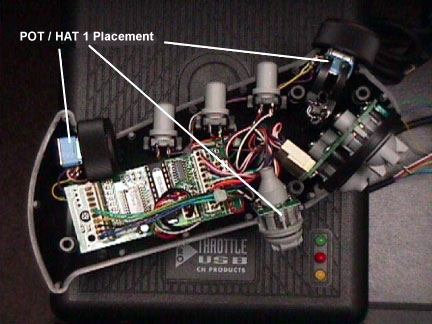 These are the same switches you will find on the CH Products Throttle Quadrant. If you are familiar with CH Products Control Manager v4.0 and higher, you’ll find a “List Mode”. “List Mode” allows for any button/switch to be pressed/toggled up to thirty-two times and will (upon release of the same button/switch) cause up to sixty-four different things you may program to happen. For instance, as Ken has indicated to me, in his Falcon 4.0 (pick a flavor) map he has them assigned to the start sequence of the F16. Coincidentally there are twenty four steps in starting the F16 in Falcon 4.0. Basically, flip the switches (left to right) twice in the up direction and twice in the down direction. And with the movement of the throttle at the proper moment, engine started! Portions of the upper case halves ribs are also removed to accommodate the circuit board the switches are hardwired to. After the switches are placed into the bottom portion of the case the upper portion is lowered to check for fit, form, and, function. My Semi-FP, pridefully signed by its creator, although I had hoped for 007 (virtually licensed to kill). By way of logistics, it was simplicity itself. I simply packed up my Pro Throttle in its original box, shock isolated within an outer box, and entrusted shipment to the USPS’ first class postage from coast to coast. Accompanying the hardware was my bank check as very reasonable remuneration for Ken’s time and materials. By special arrangement, the TQ PCB comes fresh from CH Products, just down the road apiece from Ken’s hooch, and all the other parts are locally procured “CH like” very high quality. 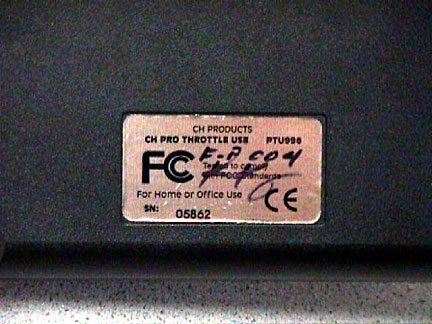 The writer’s Semi-FP serial number 004. Ken’s brainchild takes an already rock solid and versatile performer and adds just that much more. The rotary programming assignments are very straightforward and work just as you would expect for precise Falcon4: Allied Force, et al, radar articulation. Of course they can serve up any other rotary function one could desire. As already cited, the relocated commswitch is easily utilized after an unexpectedly short period of adjustment. One anomaly is that the left-right functions of the commswitch are revered due to the relocation. However, this is easily reversed by counterlabeling the positions on one’s CH Print sheet. 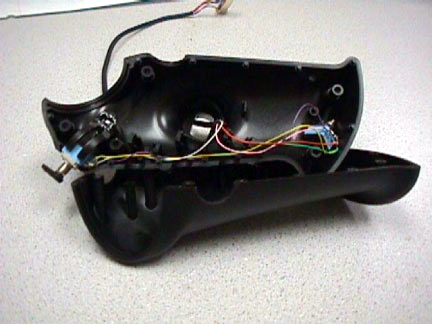 It should be noted, as one would expect, that this modification voids any CH Products Warranty and CH Products does not endorse this modification to their controllers. But again, as fresh CH Products parts are used, and expertly installed by a widely respected man who stands behind his work, that should not be a consideration, nor reservation, for the vast majority of us looking for just a wee bit more inspired functionality. 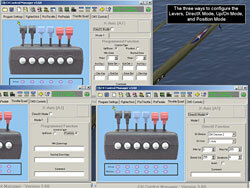 “Bill Son of Hew” Hewett is a long time flight simulation enthusiast, beta tester / consultant, and contributing author. 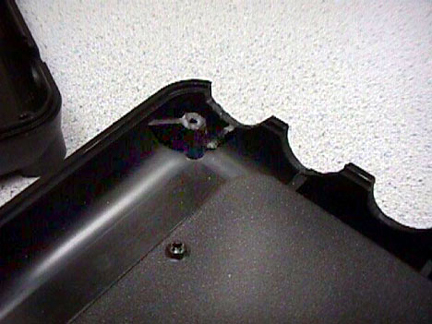 Underlying his own Marine persona is a hardware geek trying to get out and therefore his true appreciation for the ingenuity and craftsmanship demonstrated in the reviewed modification.